Pro-Ject's recent collaborations across our three pillars of business created win-win scenarios for our partners and clients. We helped Lollapalooza announce their 2019 lineup in partnership with PAWS Chicago! Check out the behind the scenes on our blog. 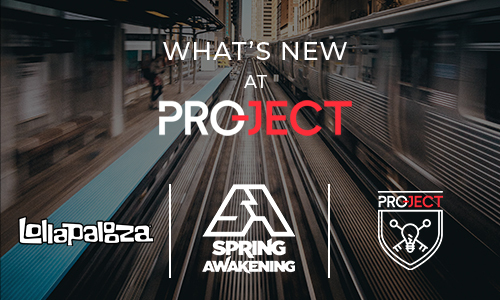 We are excited to kick off festival season by announcing the three lead partners we secured for Spring Awakening Music Festival 2019: Monaco Cocktails, EFFEN Vodka and Corona Electric Beach. Check out the full 2019 lineup and partner announcement. Pro-Ject and These Days released the third episode of our collaborative panel/podcast series Workflow. We launched a NEW Pro-Ject powered podcast series with YouTubers Number Six With Cheese (Sean Ely and Corey Wagner) and comedian Zako Ryan: The Unemployables Podcast and hosted another successful #Sectr7! Drop us a note if you'd like to connect on any of our focuses: consultancy, experiential marketing and proprietary events. We look forward to keeping you up-to date on our latest work.